Nadia Mwangachuchu with her two daughters. Mwangachuchu, a former refugee from Democratic Republic of Congo, became a first-time voter this year. On an early Saturday morning, Nadia Mwangachuchu headed over to the Tucker Recreation Center to cast her early ballot. She brought her two toddler daughters along to see their mother vote for the first time in her life. Mwangachuchu, 30, came to the Atlanta area as a refugee more than a decade ago, but became a citizen two years ago. She said she’s been waiting for years to cast her first ever ballot. Mwangachuchu, who is a nursing student at Georgia State University, is one of many former refugees in Georgia who will be casting ballots for the presidential election for the first time. While refugees have been a popular topic in this year’s election cycle – from questions about national security to helping the humanitarian crisis in Syria –refugees and asylum-seekers who’ve resettled in Georgia are ready to head to the polls. Mwangachuchu is from the Democratic Republic of Congo, but her family is Rwandan, she said. She and her family, who were Tutsi and targets of the genocide in Rwanda, were driven out of their homes by military in Congo. “We woke up one morning, people on top of your head with guns – ‘Get up, get up!’” she said. For more than five years, she said, she and her family lived in a refugee camp. Now she takes her duty as a citizen seriously. Stephanie Ali, communications and policy coordinator at New American Pathways, a refugee resettlement agency in Atlanta, said there’s been great turnout this year among former refugees who’ve become citizens. The organization has been sending mailers to new citizens who’ve recently registered to vote in Georgia with information about how to vote and sample ballots. Safia Jama, 61, who also cast her ballot early, said she’s been paying close attention to talk of refugees and Muslims this election cycle. 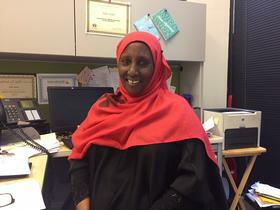 Jama came to the United States as an asylum-seeker from Somalia almost two decades ago and today helps resettle refugees with New American Pathways. Jama said she didn’t want to leave Somalia, and she wants people to understand that she had no choice. Nine of her family members were killed in one day, she said. Today, she has clients with similar stories. “I have one of my cases here, since she came, she lost nine grandchildren and her son was killed like two weeks ago, so it’s not good to tell people you cannot come,” she said. For other refugees, voting this year is about having a country to claim as home. 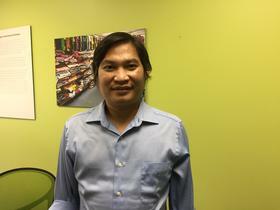 Joshua William came to Clarkston in 2009 as a refugee from Myanmar, also called Burma, also called Myanmar. He and his family had been living in a refugee camp in Thailand for about 20 years. “I feel like I’m a stateless person as a refugee,” William said. He said he wanted to become a person who would be recognized by a country, so he became a citizen last year, and has already voted in a local election and the primaries. “I can participate and I can vote, that’s why,” he said.